Are you looking to save money on your next home purchase? Well look no further! This home qualifies for a No Closing Cost Loan, saving you thousands of dollars. 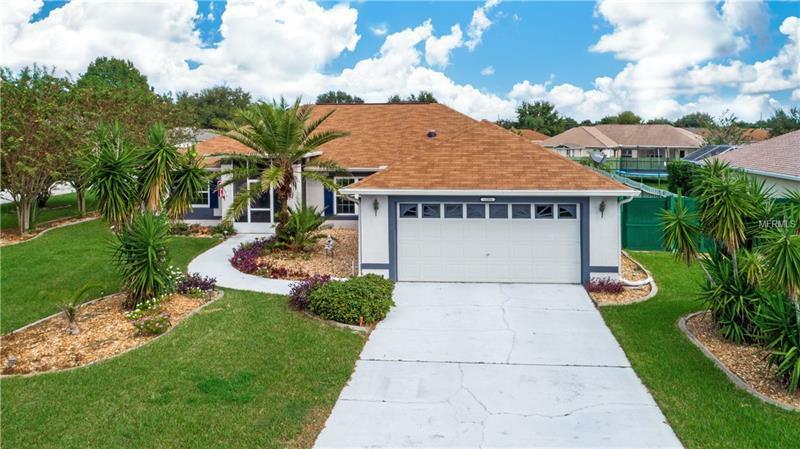 Move in ready pool home located in the desirable community of Hidden Hills of Clermont Florida awaits you. Situated on a quarter acre, corner lot you will find this 3 bedrooms, 2 and half bathroom home has it all. Upon entering you welcome the large open floor plan with cathedral ceilings, plentiful lighting and a soft color palette to compliment everyoneâs taste. The kitchen over looks the living room and offers ample counter space, tiled back splash, stainless steel appliances and breakfast bar. Master suite offers a large private area that looks out to the swimming pool. The Master bathroom has dual sinks, garden bath, and tiled shower. With a split bedroom floor plan, the other two rooms share a nicely appointed bathroom. A few of the many features you will love are the double pane windows, tiled and laminate flooring, solar heated swimming pool, large laundry room, gutters and lost of storage. Come enjoy all that Clermont has to offer â fishing, water sports, bike trails, shopping, terrific movie theater, restaurants, short drive to Disney & so much more! Schedule an appointment to view today & see all this home has to offer!